As we are all keenly aware, the Lord has blessed us to the point that we have outgrown our current facility. Over the last three years the Ozarks Christian Academy School Board has considered no less than 22 different properties to either build on or remodel to suit our growing needs. In 2016, the Board made an offer on the Robert Shaw building (formerly known as the Invensys building) but that offer was rejected. We then turned our attention to two adjoining parcels north of town. As most of you know, that property also did not work out. In the early summer of this year, we were contacted by the realtor responsible for the Robert Shaw building asking if we were still interested in the property. After reevaluating the suitability for our needs we decided to pursue the property once again. 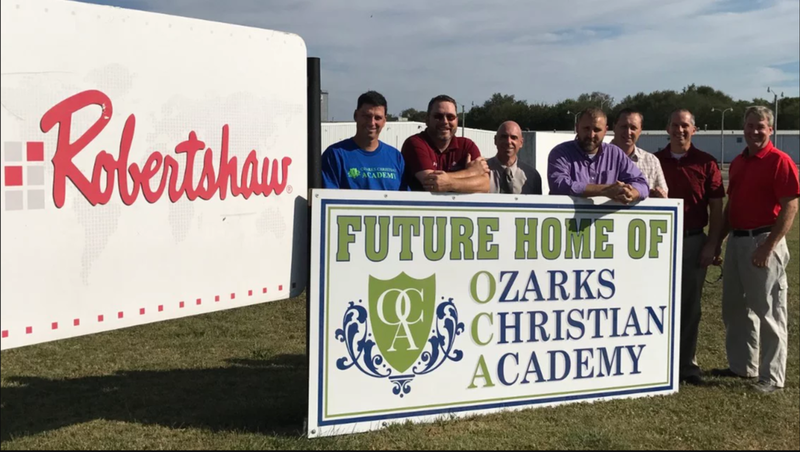 On July 20, 2017, the Ozarks Christian Academy School Board made an offer on the Robert Shaw building for the second time in 18 months. After a period of negotiations, our offer was accepted with several contingencies on both sides. One of which was that we had 30 days to confer with building contractors, maintenance personnel, West Plains Zoning and City Code officials, Fire suppression (sprinkler) experts, Architects etc. so that we could do our due diligence to ensure that the building would meet our future needs with the budget resources we have available to us. On August 28, 2017, our 30 day period was successfully completed. Then, on September 8, the remaining balance was wired and final closing documents were signed for the property that will become the third location in Ozarks Christian Academy's 13 year history. After meeting with numerous contractors, we feel that we have a solid quote for what is necessary to transform the building into what we will need for years to come. The OCA Board will work with our fundraising committee to finalize our plans going forward. In the weeks and months to come we will begin the process of communicating our needs and the strategy we will implement to accomplish our goals. The board would like to thank all of the parents, grandparents and donors for their patience while we have labored through this very arduous process. We take the responsibility of the trust that you have placed in us quite seriously. In closing, there is one aspect the Board would like for all of you to remember. We do not see this as our final destination. The newest facility will obviously serve as our home for many years to come, but It is our goal to continue searching for an eventual site on which we can build a new purpose built facility. This current decision is just one more gradual step in OCA's growth. This newest facility will give us the room and time to continue growing as well as searching for the Lord's will in our next steps of this long journey. Thank you again for all of the time, effort and resources that so many of you have invested, and may God continue to bless Ozarks Christian Academy.